Teasers are a great addition to any type of lure or rig. 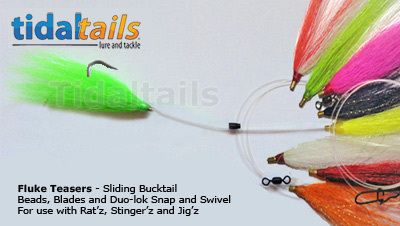 Our teasers are made with real Northern Deer Tail and tied for durability. We use Eagle Claw Lazer Sharp nickel hooks for great hook sets. 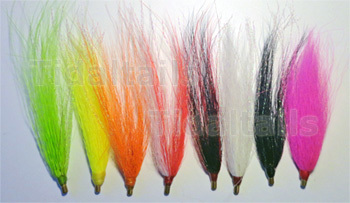 They come in a varity of colors to better target game fish. Used for Fluke, Striped Bass, Weakfish, and more. Dressed VMC Open Eye Siwash Hooks. 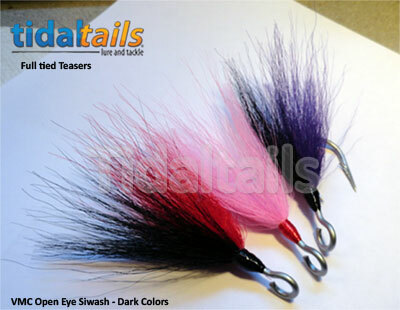 These are a fully dressed siwash teasers with High End Saltwater Northern Deertail. Great Replacement tail hook for plugs, darters and swimmers. OPEN EYE TEASERS - VMC - Standard Color Teasers. OPEN EYE TEASERS - VMC - Dark Color Teasers. ECONOMY - VMC Open Eye Teaser. OPEN EYE TEASERS - VMC - Standard Color Economy Teasers. 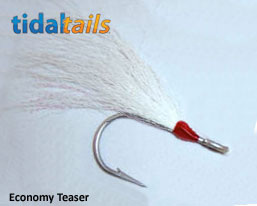 Sliding Bucktail Teasers with Monofilament Leaders - Great for use with Bucktails and Jigs. 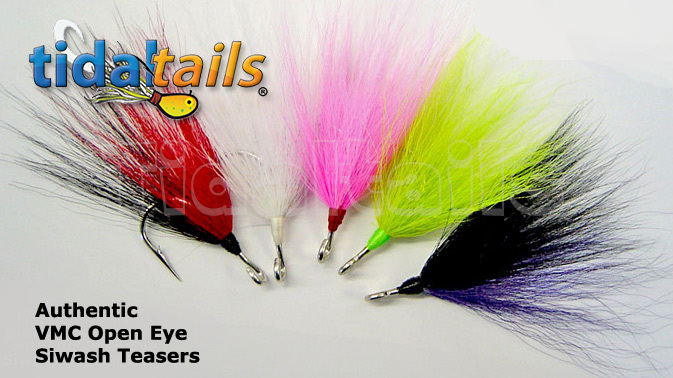 Sliding Bucktail Teasers with Fluorocarbon Leaders - Great for use with Bucktails and Jigs. Great for making your style teasers and rigs. 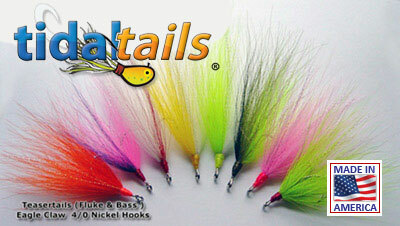 Curtails Grubs - Awesome action Curltail Grubs - The saltwater formula tough grubs, added to the bucktail makes for some fantastic action that really gets them going. These stainless steel fast snaps can be used in place of lock snaps or snap swivels. The unique design allows for quick attachment of your rig or lure and can also be used with a swivel. Pay Pal is a leader in security technology.